Once home to America’s most notorious criminals, Alcatraz is best known for being one of the world’s most legendary prisons. With plenty of stories compiled within its walls, this is a truly fascinating day out. The prison’s infamous inmates, including Al Capone and Robert Stroud, put Alcatraz on the map, but the island also served as a harbour defence fort and military prison in the 19th century, and is the location of the restored first lighthouse on the Pacific Coast. You’ll discover it all during your journey to this historical prison, even seeing a few hidden spots used for attempted escapes as you cruise over to the island. 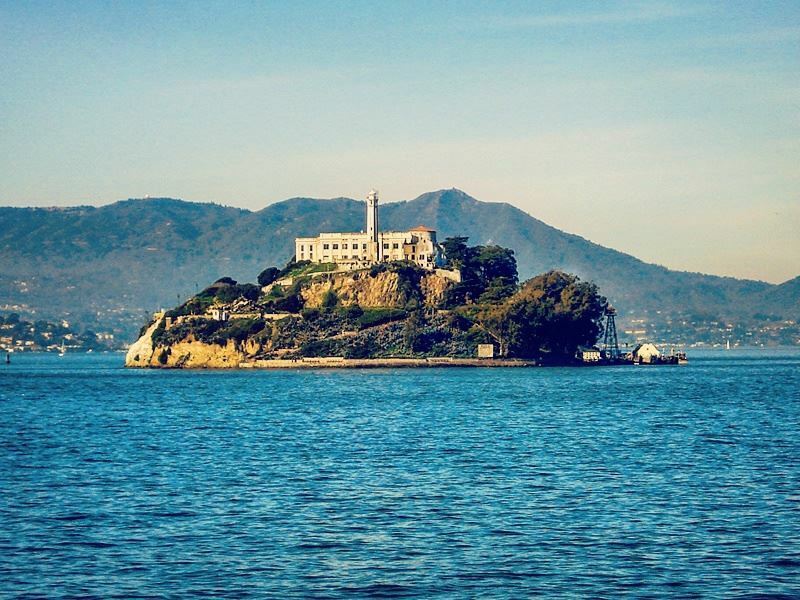 All of the tours - whether you choose an Early Bird, Day Tour, Night Tour or Behind the Scenes Tour – include round-trip transportation, as well as the interesting Doing Time: The Alcatraz Cellhouse Audio Tour, which will let you in on the prison’s best kept secrets. However, to really delve into Alcatraz’s incredible history, we’d recommend going behind the scenes. Exploring tunnels, underground jails, a special garden and unknown doorways, you’ll certainly delve into what life was like as one of America’s infamous criminals. When visiting San Francisco, of course you’re going to want to explore the city in full – but sometimes this entails achy legs and stressful map reading. So, let us introduce you to the first ever GPS-guided storyteller car – the GoCar. 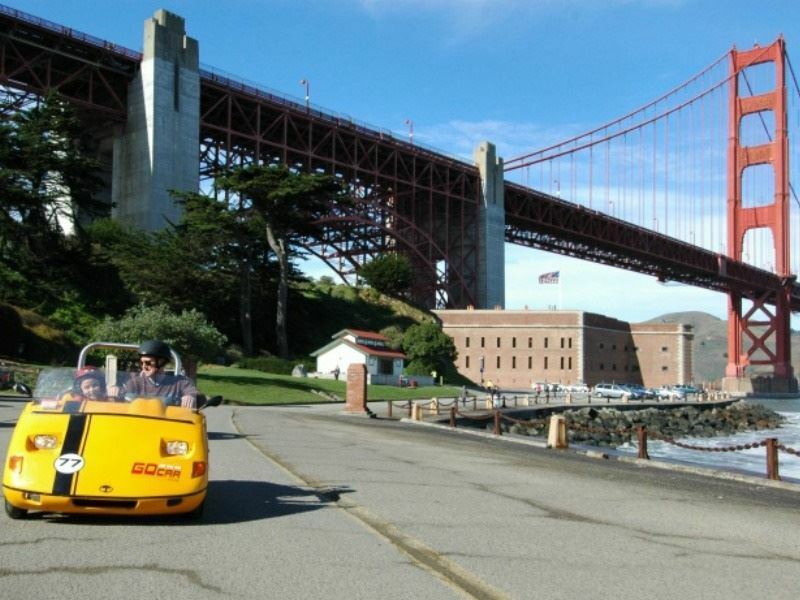 Named one of the most amazing inventions of the year by Time Magazine, GoCar Tours takes the stress out of city exploring, offering small, bright yellow cars that will take you to over 200 points of interest. Your tour can be as long or as short as you like, stopping off for coffees or a quick shop in Union Square. Drive down Lombard Street – known as the most crooked street in the world – spot sea lions basking by Pier 39, or even journey to bustling Fisherman’s Wharf, all the while enjoying your GoCar’s built-in commentary teaching you all about the city’s culture and history. This is the perfect chance to experience San Francisco from the local’s perspective. As the sun sets and the city lights turn on, San Francisco’s streets buzz with excitement and liveliness. 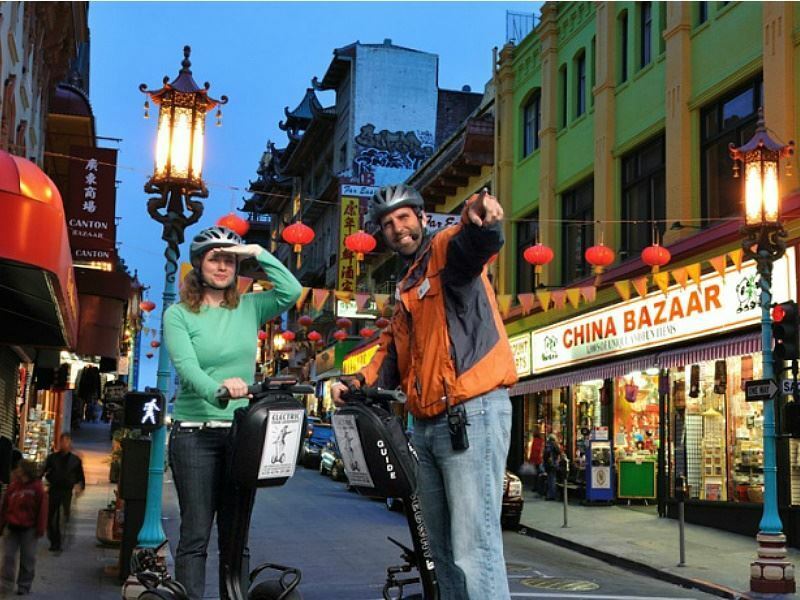 A Segway tour is a wonderfully fun and unique way to explore the city as day turns to dusk, weaving your way through hidden locations and admiring a different view of San Francisco’s icons. Your tour will last around 3 hours, 40 minutes of which will be spent learning the ropes and enjoying a fun training session. Soon, you’ll be speeding past busy bars and bustling shops, discovering three of the city’s most interesting neighbourhoods. Start with North Beach Little Italy, a renowned culinary destination that will envelop you with delicious smells of authentic Italian fare, before gliding through vibrant Chinatown for idyllic views of the Transamerica Pyramid and the Ferry Building. Next up is Fisherman’s Wharf, offering picturesque views of hidden gems like the Pampanito submarine, Alcatraz Lighthouse and Fish Alley, before looping back round along the Waterfront and ending your epic tour with a strong Irish coffee at Buena Vista Café. Think of San Francisco, and your mind will mostly likely conjure up an image of Golden Gate Bridge, the iconic bright red suspension bridge sweeping over the Golden Gate strait. How about turning those images into reality – or even going one step further and cycling across? 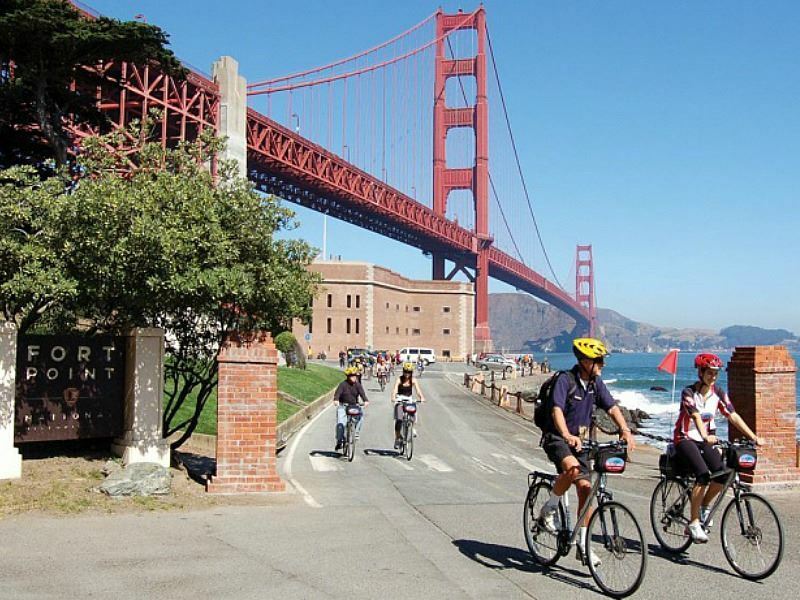 Getting on your bike and pedalling over the bridge is an amazing way to soak in views of the city, and get up close to one of America’s most famous landmarks. This scenic ride is best started from Fisherman’s Wharf, and it’s an 8 mile journey from there to the ferry pier in Sausalito. Typically, the ride should take around 90 minutes, but we’re certain you’ll want to stop and take a photo or two. Before you even reach the bridge, there’ll be plenty of pit stops you might want to make – including Fort Mason and Golden Gate Park. Once you’ve cycled over the bridge, you’ll find Sausalito; a gorgeous little city full of quirky neighbourhoods, a picturesque waterfront, and 500 kooky houseboats. Sausalito is perfect for those looking for a more leisurely and laidback day out, with time spent dipping in and out of outdoor dining spots, marvelling at the 1.5 acre working model of San Francisco Bay at the Bay Model Visitor Centre, shopping in trendy boutiques, and even kayaking along the calming shoreline. It’s worth it even just for the ferry ride – it’s less expensive than a tour boat ride, and much more scenic too. The cycle over Golden Gate Bridge is simply phenomenal, and for the best views we’d recommend starting your journey early in the morning to beat the crowds. Grab a rental bike from Fisherman’s Walk, pop on a few layers (it can get quite chilly on the bridge), and get ready for one of the most spectacular bike rides in the world. Just try not to get too jealous of people who have this iconic landmark as part of their daily commute. 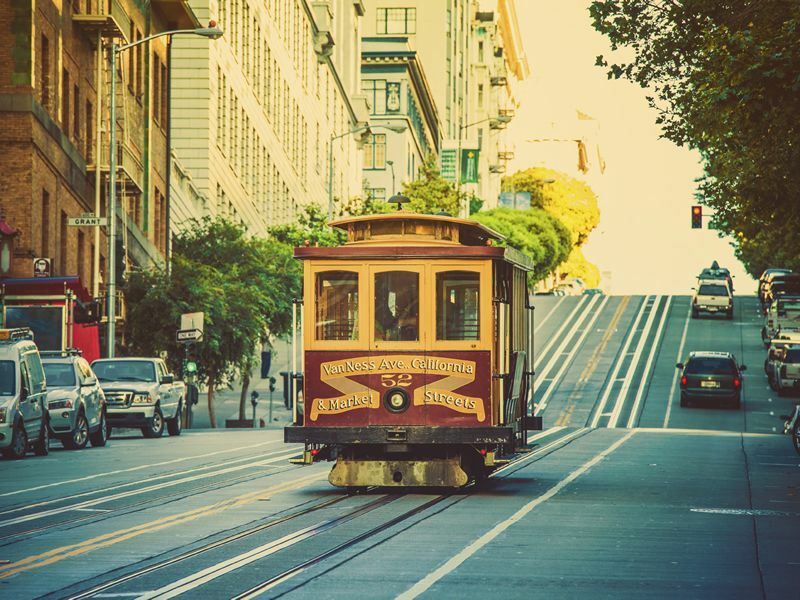 San Francisco is an amazing city, full of landmarks you won’t want to miss should you want a quintessential experience - including the famous cable cars. The world’s last manually operated cable car system, the city’s cable cars have become a historic symbol, and offer a great way to explore the city to boot. Some may suggest that the cable cars are a cheesy attraction, but we think differently. A trip to San Francisco just isn’t the same without trying out this urban transport network, and it’s a fairly inexpensive way to get around, too. For the best views of the city, sit on the side that faces the bay. $7 per trip, $21 for a day pass. The Golden Gate Bridge, cable cars, Alcatraz…San Francisco has plenty of cool landmarks to see. But what to do after working up an appetite? Thankfully, San Francisco has a booming foodie scene, with plenty of delicious, award-winning eateries – from ethnic Asian restaurants, to home grown delights. North Beach Tour – This flavoursome tour showcases San Francisco’s oldest and best eateries, including a delicious pizza and rosemary focaccia from a 100-year-old bakery, and fresh meats from a world-famous delicatessen that presented a salami to the Pope. Finish it all off with a homemade truffle – divine. Chinatown Food Tour – The city’s ethnic food scene is rife, especially the restaurants nestled in San Francisco’s vibrant Chinatown. 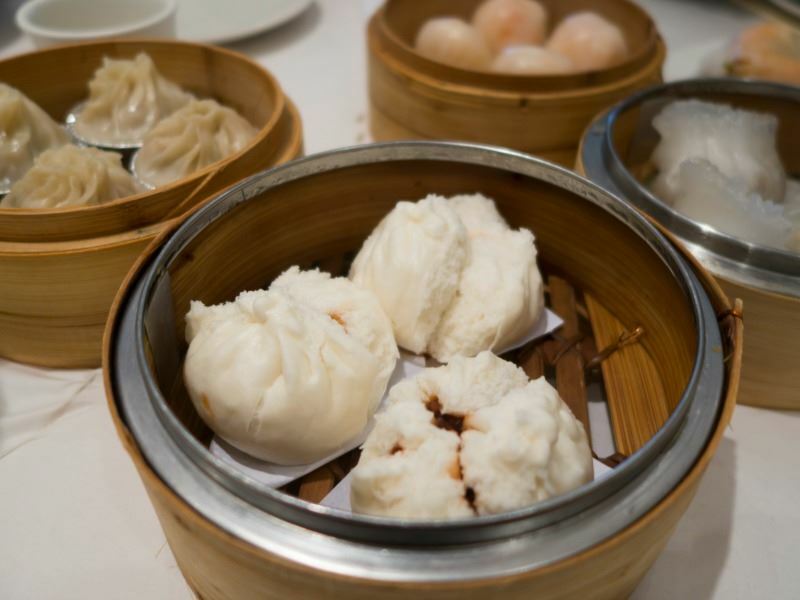 Tuck into sumptuous Asian delights, including Cantonese barbeque-pork filled buns, Barrack Obama’s favourite dim sum, and Beijing Peking duck. Mission District Food Tour – San Francisco is home to a multitude of award-winning restaurants and chefs, and this is your chance to try a few. Start with a baked treat created by the chef who won the coveted James Beard Award for Outstanding Pastry in 2008, before tucking into a gluttonous pizza – named the third best pizza in the USA by American food writer and critic Alan Richman. What could be better than enjoying the Californian sun whilst sipping a chilled glass of white wine? 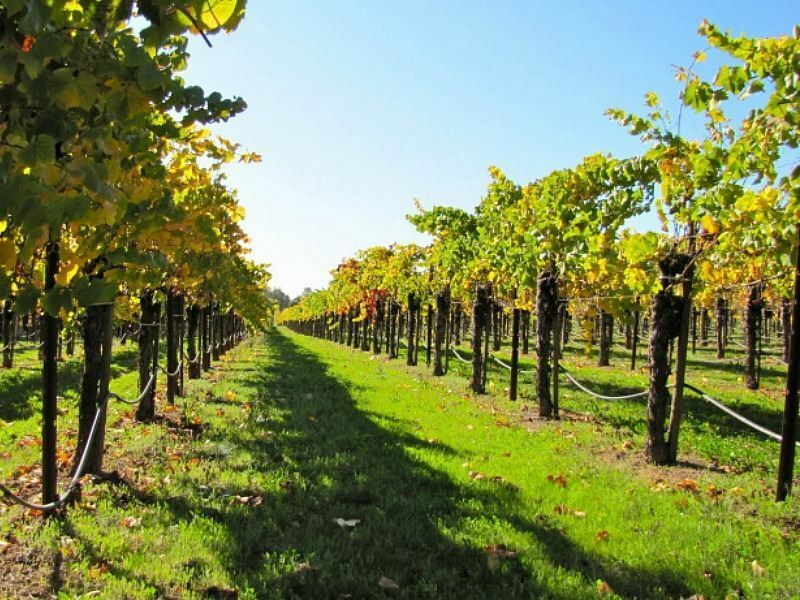 Just a short journey from San Francisco, the breath-taking Napa and Sonoma counties make up the premier wine growing region in North America, providing truly wonderful afternoons full of wine tasting and soaking up the picturesque views. Your day of leisure will begin in San Francisco, driving through the Marina District towards your first stop-off: the beautiful Vista Point of the Golden Gate Bridge. Soon, you’ll journey through the naturally stunning Marin County before reaching Napa and Sonoma and visiting three gorgeous wineries, ranging from large, industrial vineyards, to smaller and more unique boutique tasting rooms. Learning about the region’s rich wine making culture, all the while sneaking a taste of some of the best beverages in California…this is the perfect mid-holiday escape for culture junkies and budding wine connoisseurs. San Francisco is well-known for its vibrant streets and incredible man-made attractions. 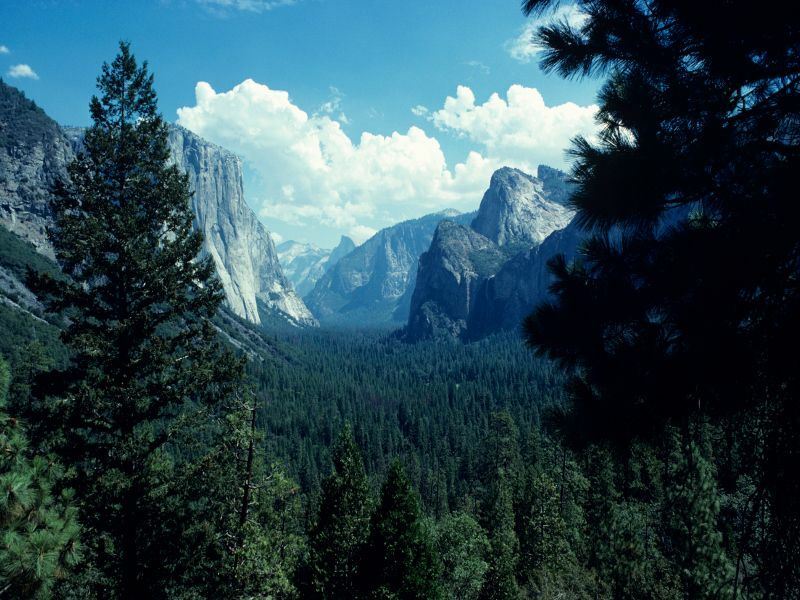 But little do most people know, just a four-hour drive away is the natural splendour of Yosemite National Park, one of North America’s most beautiful outdoor playgrounds. Dramatic mountains soar high up in the sky, whilst fierce waterfalls cascade down craggy cliffs and glaciers stand tall amongst sweeping valleys. The never-ending wilderness of Yosemite National Park will surely take your breath away. In order to explore this wild oasis, you’ll need to wake up early – early enough to catch the sun rising over San Francisco Bay, before boarding a coach to Yosemite. Winding through Central Valley – the most productive agriculture valley in America, along the gorgeous Merced River and past the towering Sierra Nevada Mountains, the journey itself is already abundant in incredible photo opportunities. Once you’ve arrived at Yosemite National Park, you’ll have the rest of the day to explore the vast landscape with an experienced guide, gazing at astonishing views of Yosemite’s most iconic attractions, including Yosemite Falls – the third highest waterfall in the world, and the fascinating Half Dome Cliffs. Those seeking adventure and hoping to see California beyond San Francisco’s lively streets will relish a day exploring this unforgettable land.